The series is a meditation on the dreams and realities of revolution, based on photographs I took in Alexandria, Egypt, shortly after January 25, 2011. 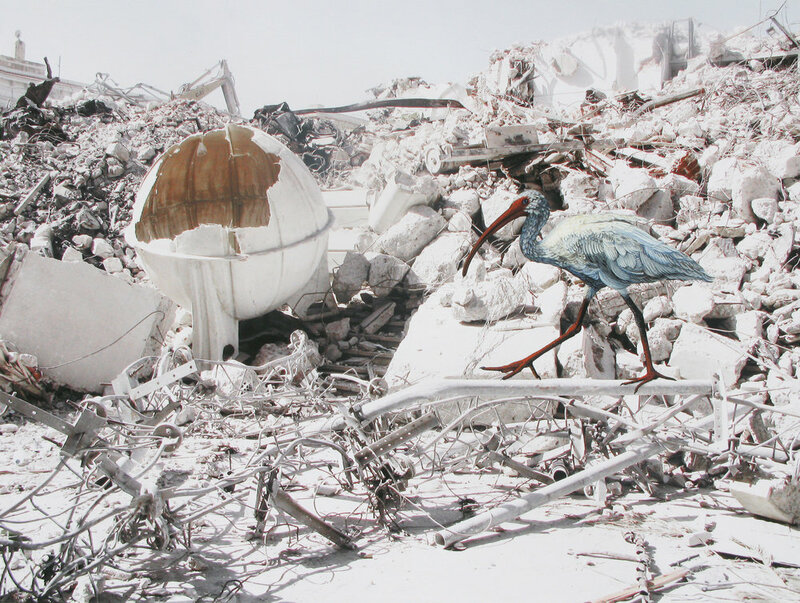 The ibises painted in gouache strut and peck amidst piles of rubble destined for landfill, perhaps oblivious to the upheaval, simply going about their business. The ibis often appears as the head of Thoth, whose mythological powers might offer the logic and intelligence necessary to build a new nation. It is reputed to have warded off invasions of serpents. Perhaps it might protect again — against backsliding, a substitute tyranny, or other kinds of invasions. Springtime in Alexandria invokes a season of hope that has become a climate of bitter realities. What sustenance might a bird or any living being, ordinary or sacred, derive from a ransacked economy, from rubble of an order that was far from universal, from justice twisted and denied? The ibis often appears as the head of Thoth, representing intelligence and logos and also symbolizing protection against invading serpents. 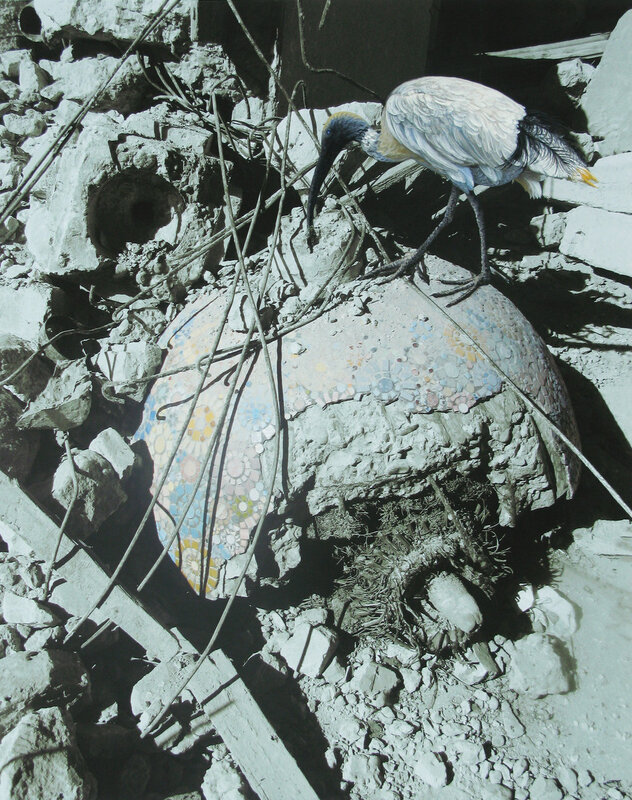 In these works, the ibis pecks and struts amidst the rubble, reintroducing vitality and hope for more than survival.SPRINGTIME IN ALEXANIn March 2011, shortly after the Revolution in Egypt, I walked past backhoes and jack hammering men demolishing the remains of Alexandria’s former main government building. Built in 1890, it housed the provincial governor’s office, valuable paintings by Egyptian artists including Adham Wanly, Seif Wanly, Mahmoud Said, Mohamed Nagy and Hussein Bikar, and a library containing many rare books, maps, letters and documents related to the city’s history. According to our Egyptian contact Ahmed Shaker, an articulate computer scientist, it also had housed a control room that enabled surveillance of the city’s main roads; therefore, the building most likely contained records of police brutality conducted against peaceful protestors on those very same roads during the first three days of the Revolution. An essay derived from my 2013 diary in Egypt. On January 28, 2011 this government building was set afire by Molotov cocktails and subsequently looted. Newspaper accounts state that it was allowed to burn and smolder for four days or more. Given the value of the building and its contents, many wondered why. Ahmed surmised that the authorities did not intervene for several reasons. One was to leave ample evidence that might promote public perception (and rejection) of revolutionaries as hooligans and thugs. Another was that ignoring the fire would result in the convenient destruction of records of the authorities’ own abuse and corruption. Esmat Dawestashy, an artist and former director of the Museum of Fine Arts in Alexandria who is now head of the Alexandria Creativity Centre proposed another theory in the newspaper Al-Ahram: not responding to the fire and the looting provided cover for one of the biggest art heists in Alexandria's modern history. * Security’s apparent laissez-faire approach to the incident became even more suspicious when considering that the adjacent Greco-Roman Museum, with 27 halls of ancient treasures, was left untouched. Speculation on all these fronts seemed typical of the shifting narratives that occurred during and after the Revolution. Mountains of debris were all that was left of the building when I encountered it. 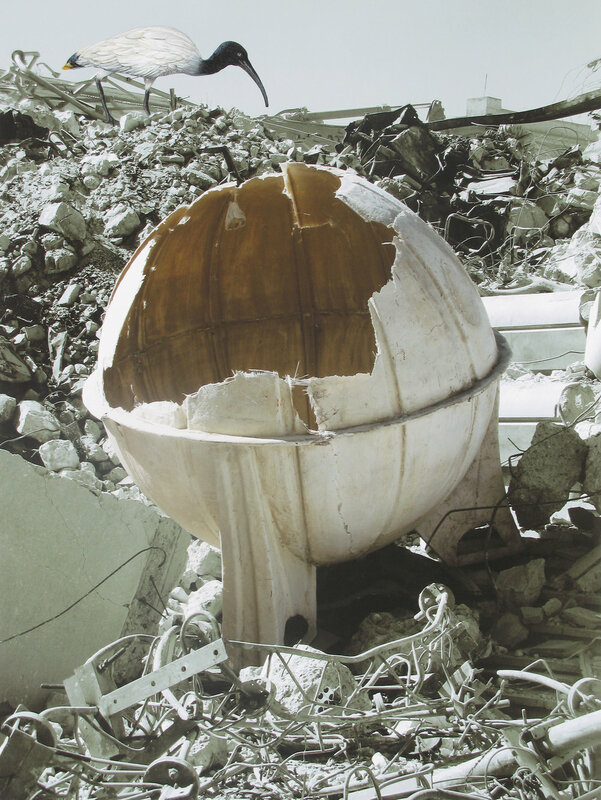 As and artist and author of Out of Rubble (Charta, 2011), a book examining the aftermath of war through contemporary art, I began to photograph. Amidst mangled metal and chunks of cement, stone and brick, a huge cracked egg structure rested in the mounds, covered in mosaic of a floral design. The photographs I took became the basis for the Springtime in Alexandria series. As in my prior work, I first manipulated the images in Photoshop (modifying color and composition). 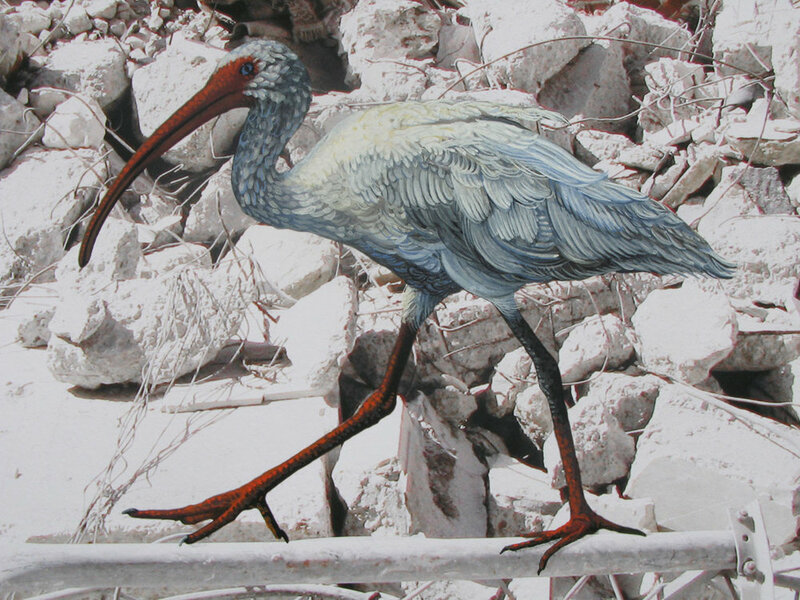 Using gouache, an opaque watercolor, I then hand-painted scenes of cultivation, construction, flora or fauna into the photographed scenes of destruction. I wanted the human touch to intrude upon and alter the photographic record, suggesting that we can change the physical, political and social conditions we live in. Images can document but art can transform. Combining painting with photography is one way to have the real and the imaginary — what once was with what might be — coexist. Painted interventions can reveal what has survived or what has been lost or pose the possibility of rebirth and recovery. For this series, I chose to paint the ibis, a bird that appears in ancient Egyptian sculpture and painting and thrives as a species today. Often mummified and venerated, the ibis head is honored as a symbol of Thoth, who was the personification of the universal order, the 'heart and tongue' of the sun god Ra who 'spoke the words' which resulted in the creation of the heavens and the earth. In ancient Egypt, the ‘heart’ was the seat of intelligence or the mind. Standing for the universal order, Thoth later became associated with arbitrating godly disputes, magic arts, the system of writing, the development of science, and the judgment of the dead. In historical and mythological accounts, his symbol, the ibis, was credited with devouring invasions of winged serpents, so the bird was regarded as a protector. Today, the ibis’ numbers are expanding to often push out other species. To supplement its natural diet, the species often scavenges at landfills and dumps. 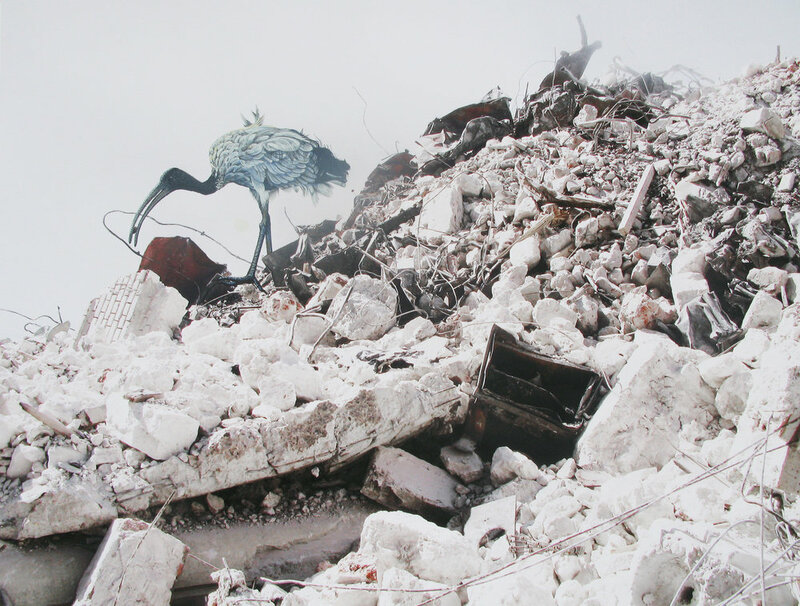 In Spring in Alexandria, the ibis struts and pecks amidst piles of rubble destined for landfill, perhaps oblivious to the upheaval, simply going about its business to sustain itself. Returning to its mythological powers, the ibis might represent the logic and intelligence necessary to build a new nation, symbolically acting as a “protector” against backsliding, a substitute tyranny, or other kinds of invasions. Springtime in Alexandria invokes a season of hope in a climate of bitter realities. What sustenance might a bird or any living being, ordinary or sacred, derive from a ransacked economy, from rubble of an order that was far from universal, from justice twisted and denied? The promise of the Revolution is a long-term proposition. Building on the logic and intelligence of Thoth, it must be rooted in ground realities. Embodied as the ibis, it must not forget to soar. *In June 2011, Esmat Dawestashy exhibited a painting in Zamalak of his recovered son, Abdallah (who was injured with a bullet to his chest on January 28) in front of Alexandria’s State Security building as protestors stormed in on March 4, after clashing with security forces. Another version of this essay appears in Cairo: Images of Transition, edited by Mikala Hyldig Dal, Verlag/Columbia University Press: Cairo, 2013. This series premiered in Sites of Passage, Mattress Factory, Pittsburgh PA, September 9, 2011– February 12, 2012.